Where does great writing come from? The difference between good writing and great writing has nothing to do with the neural pathway between your head and the keyboard. Great writing begins where all worthwhile journeys begin — in your heart. A case in point is the story of one Edward “Ted” Hall. Ted Hall grew up in Red Wing, Minnesota. He was probably destined to be a journalist (his father was a “newspaper man”). Ted’s own news writing ability would lead him to Newark, New Jersey and then to Time magazine, where he would become the political editor. But Ted Hall had a higher calling. As a boy, he had been introduced to a man named Ernest Oberholtzer. “Ober” as he was known, spent almost all of his time on a Rainy Lake, Minnesota island located just 1/4 mile from the Canadian border. Ober was a legend in Minnesota and well beyond. In 1909 he and an Ojibwe friend Billy Magee, had taken a historic 3,000-mile canoe trip into the largely uncharted Canadian wilderness. 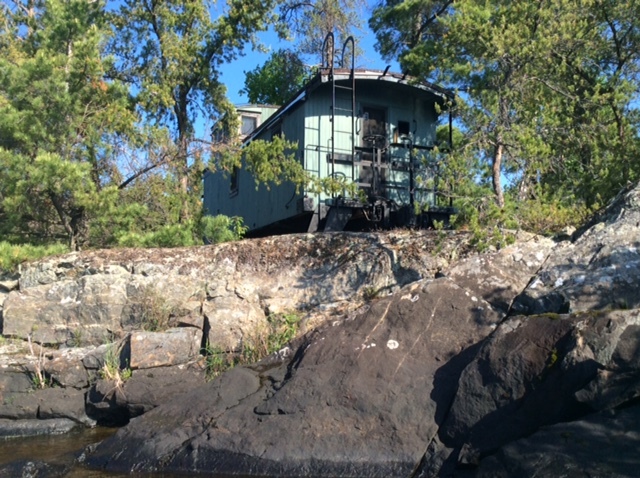 The trip subsequently inspired Ober to spearhead the protection of what would become the Boundary Waters Wilderness Area and the Quetico Provincial Park. Thirty-seven years older than Ted Hall, Ernest Oberholtzer became a mentor and introduced the boy to the vast, beautiful region. By the time Hall entered his early 50s and was working in a New York office, he began realizing he wasn’t where he wanted to be — neither geographically nor professionally. There were two things pulling at him – the need to get away from “big journalism” and the need to get out of the big city. So, he quit his job, bought a Maine lobster boat and piloted it up the Hudson River, through the Erie Canal, across the Great Lakes and all the way to Duluth. From there, he had the “Claire” trucked to Rainy Lake. He also bought a caboose and had it hauled to an island he bought next door to Ober’s known as Gull Island. This became his island oasis. That took care of the “getting away from the big city” part of his dream. But what about his writing? Ted had a plan for that, too. He cashed in his pension and created his own newspaper. The Rainy Lake Chronicle paid him a salary of $5,000 per year — 1/5 of the salary he was earning as a nationally known reporter. But he wasn’t in it for the salary anymore (if he ever was). He was in it because of his love for the region and his deep-seated desire to write about it. Ted Hall spent a decade writing the Rainy Lake Chronicle. His stories are beautiful, inspiring and passionate. They are not stripped of those attributes like those that must pass through several levels of approval. The most memorable are those he wrote about Ober’s life and work to preserve the wilderness. Ted Hall’s writing is great precisely because it came from his heart. Reading the articles he wrote decades ago brings as much pleasure today as it must have done for his 10,000 readers those many years ago. For a writer, it doesn’t get any better.